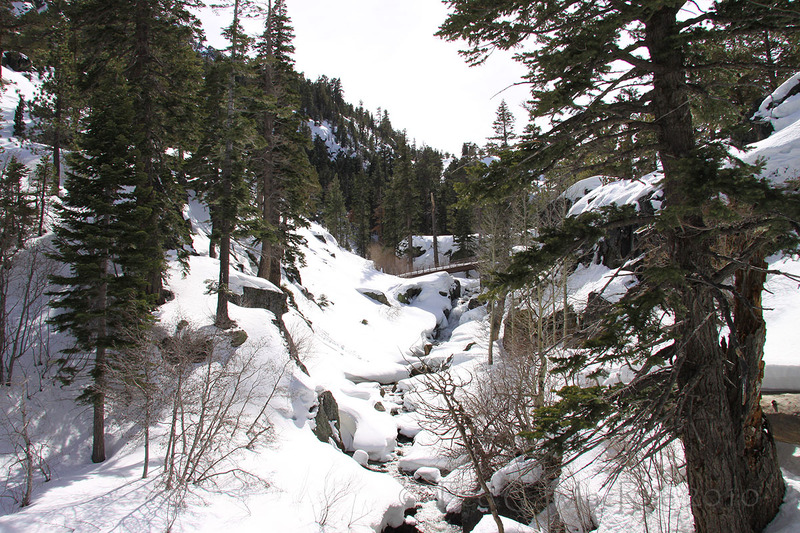 During last year’s visit to Lake Tahoe, we attempted to hike Eagle Falls Trail, one of Lake Tahoe’s most scenic and popular trails. 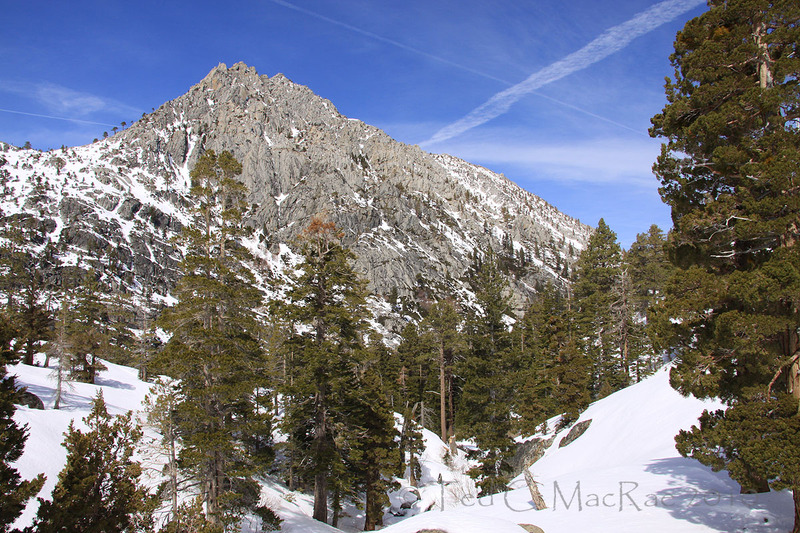 Beginning at the Hwy 89 trailhead above Emerald Bay, this trail climbs a dramatic ‘glacial staircase’ with steep, narrow gorges connecting a series of deep lakes and meadows. Each of these lakes, and indeed Emerald Bay itself, was formed as a result of glaciers that carved Lake Tahoe’s granite shores until as recently as 10,000 years ago – leaving behind scars of incomparable beauty. Eagle Lake perches atop one of these steps – only a short, one-mile hike up the trail but rising nearly 2,000 feet above the trailhead. Summer hikers have trouble enough dealing with this elevation gain, but winter hikers – as we learned last year – find it impossible without the assistance of snowshoes. The first steep section just short of Upper Eagle Falls would prevent any further progress, leaving me with only a teasing view up the gorge and a commitment to try again on our next visit. 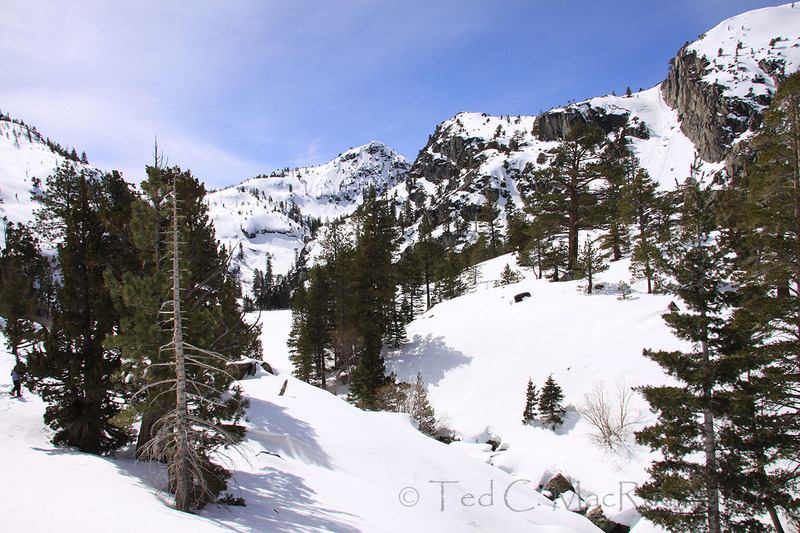 There was even more snow this year than last – a good 4-6′ it appeared, but our rented snowshoes made this irrelevant (even desirable), and the four of us began the arduous task of climbing the snow-laden slopes all the way up to Eagle Lake. It was a family affair, so the pace was dictated by 10-yr old Madison, who got us to Eagle Lake – serenely beautiful and frozen solid – in a leisurely 1 hour 45 minutes. The hike back down the gorge passed more quickly (almost too quickly) but provided spectacular views of Emerald Bay and Lake Tahoe below. 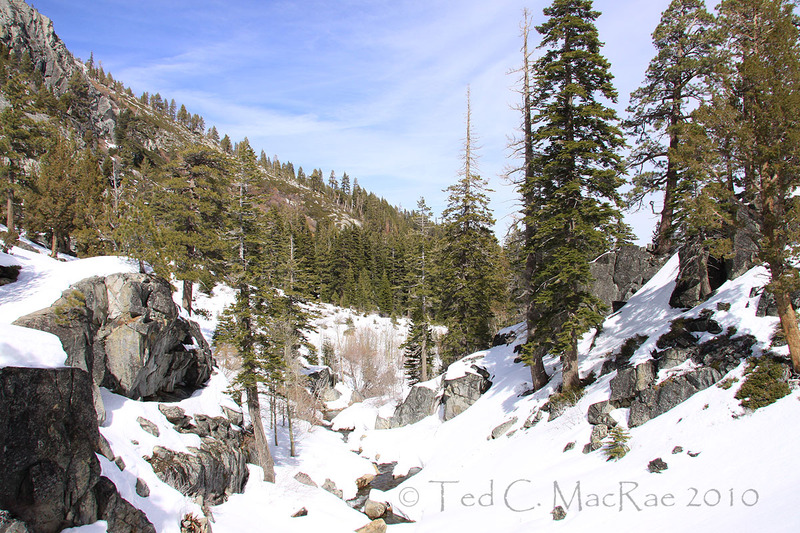 Those of you with an interest in the geological history of Lake Tahoe may refer to my earlier posts, Lake Tahoe, California (Mar 2008) and Born of Glaciers (Mar 2009). The rest of you may just enjoy these pretty pictures. View of Upper Eagle Falls - it was here where our hike last year would end. View back down the gorge from bridge over Upper Eagle Falls. Looking back down at Emerald Bay from Eagle Falls Trail. Further up the trail, one looks back upon this spectacular view of Jake's Peak. Eagle lake lies at 8,500' elevation (frozen lake surface visible through trees left). This entry was posted in [No taxon] and tagged California, geology, Hiking, Lake Tahoe, landscapes, mountains, nature, science. Bookmark the permalink. Jaw dropping scenery there, Ted. Snow and blue skies look great together. Certainly one of the most photogenic places I’ve ever visited. Been there three straight years now over Spring Break, and I never tire of the views. Once again envy is the deadly sin! 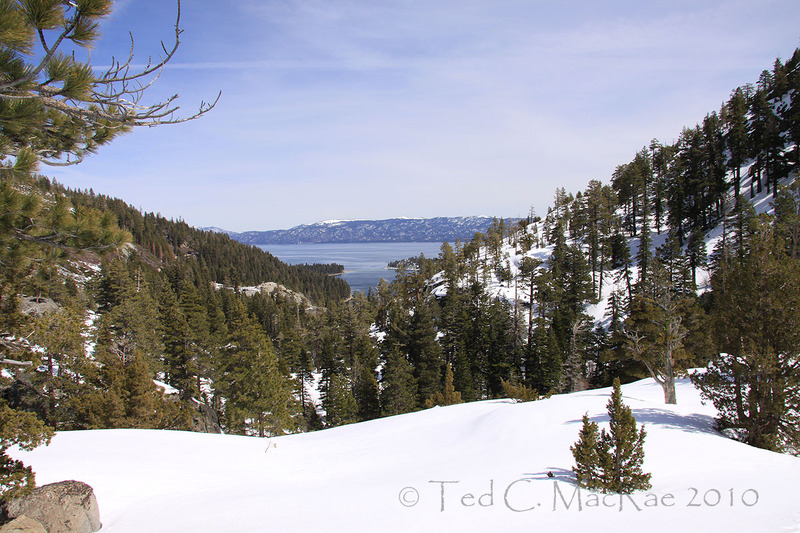 I’ve down-hill skied the Tahoe basin at several sites! Mt. Rose, Squaw, and Heavenly Valley! Thanks Rod. We only ski Heavenly now, since that’s where our condo is, but when we lived in Sacramento we tried out most of the different resorts. Never tried Mt. Rose thought (although I’ve now hiked it). Sometimes, envy is not all that bad! Absolutely stunning! What else can I say? Thanks Shelly. Sometimes the scenery there actually does leave you speechless. What views! Stunning and spectacular scenery and enjoyable time with the family. Sounds like a good combination. Time with the family is always good, but getting them out there in ‘my element’ is really special.